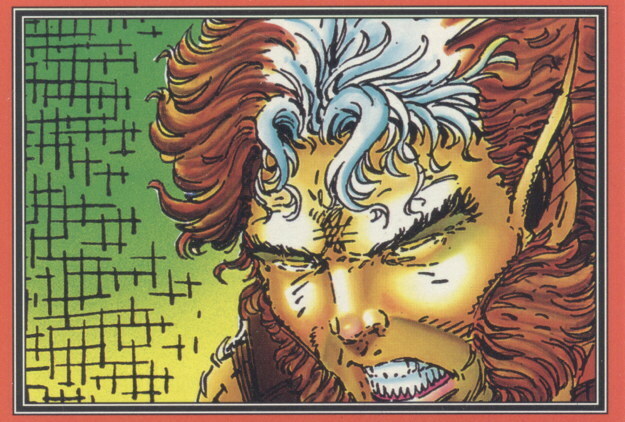 Let us all bask in the soothing glow of this Youngblood trading card featuring Cougar. Ahhhh…just what the doctor ordered. Guess I still gotta go to work. 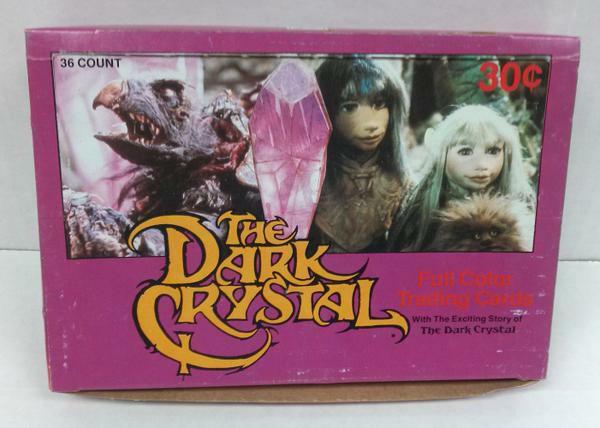 That’s not to say these Dark Crystal cards won’t sell. They clearly are, just not for the “Mike can retire early” money I was hoping for. 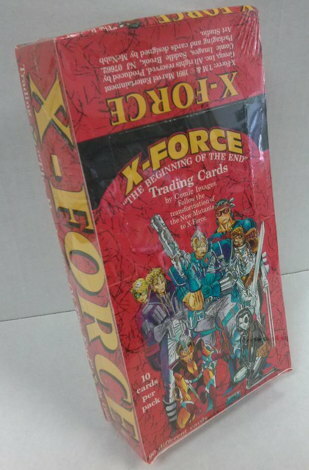 Of course, that doesn’t explain why those X-Force cards sell for slightly better money. Those are all just pictures taken from the comics, as I recall. 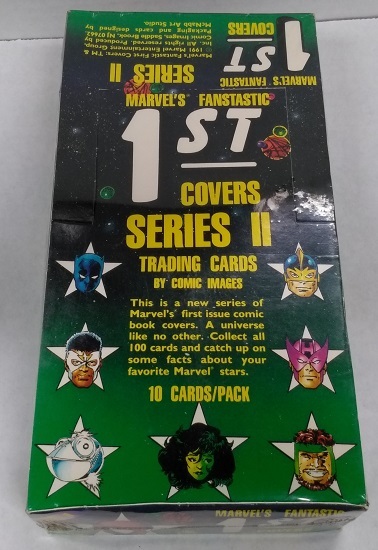 If you have the comics, you have all the images in this set. Is it just the act of collecting and collating the cards? There aren’t even rare chase cards in this particular set. Of course, the answer could just be “I like superhero comic cards, so back off, mister,” which is perfectly fine with me. 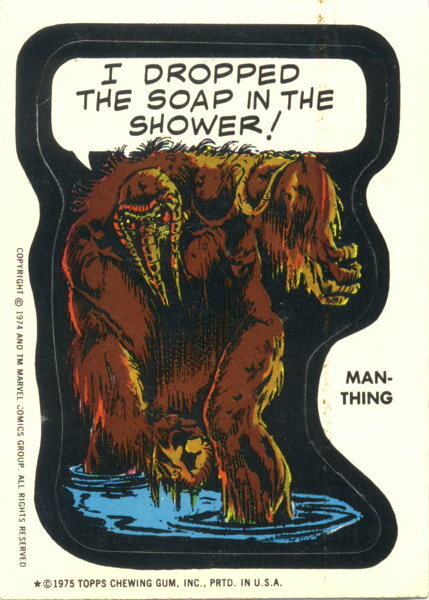 So anyway, have I shown you this Man-Thing sticker from 1975? 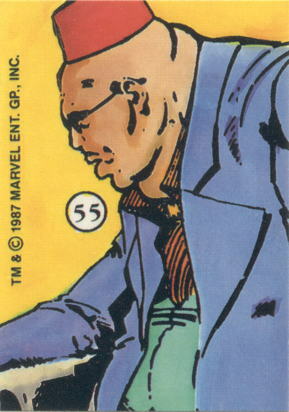 That’s the joke you’re going with, 1970s-era Marvel and / or Topps? Well, okay then. 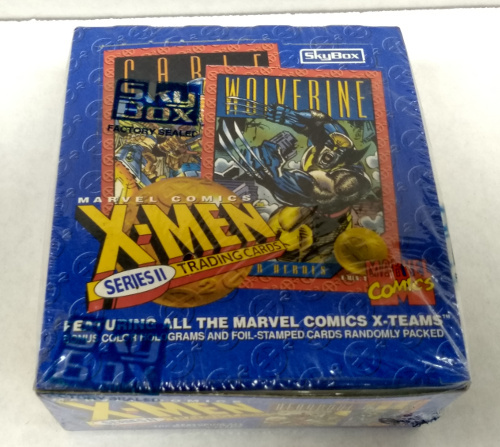 Trading card accumulation was a real symptom of ’90s comic collecting, where one could get in cases of Jim Lee’s X-Men or what have you and easily expect to sell through all of them. 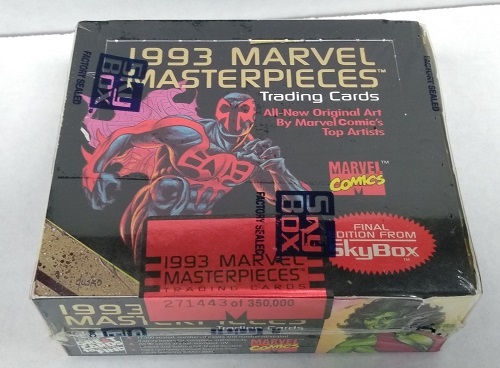 That particular aspect of the market seems very diminished now…we received the 2014 Marvel Universe cards this week, and expect it’ll take a while to work through even a single box of those. 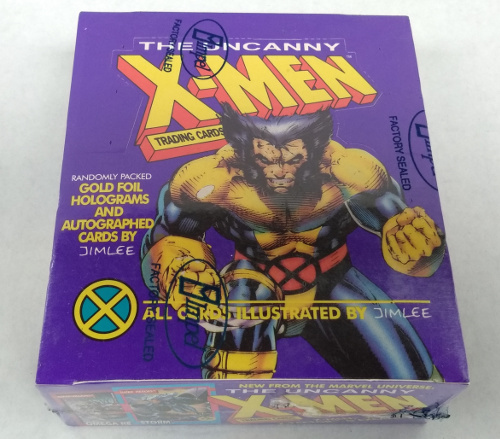 The comic collector/card collector overlap likely burnt out in the overproduction of product a couple of decades back, from both sides of the equation. 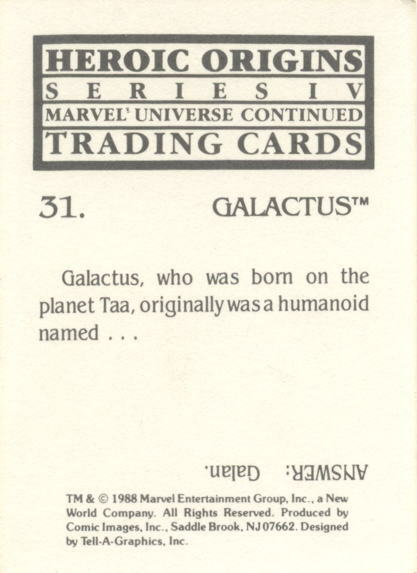 I remember personally buying and collecting various trading cards, and being fairly excited about tracking down those last few missing numbers I needed to complete a set. The very act of opening packs and collating sets was a strangely satisfying and fun activity in and of itself. And then, suddenly, that particular collecting urge within me went away. It’s not like I have any newly-found disdain for the card sets I do have: I’m glad I have my Death of Superman set, or that set of chromium cards featuring Golden Age covers, or those two sets of Berni(e) Wrightson cards (with their accompanying special Berni(e) Wrightson binders! 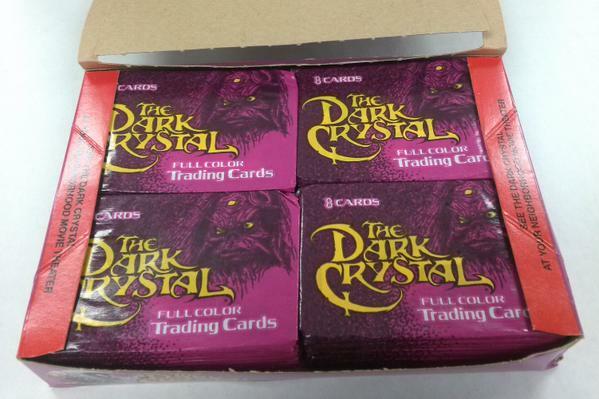 ), or any of the other oddball sets I’ve gathered. I simply no longer have the desire to obtain more sets, buy more packs, sort more cards. There are circumstances where I would want to buy more cards, of course, but more as a subset of other obsessions, rather than “I must buy and complete this new set of cards.” If DC Comics put out a new line of cards that included Swamp Thing images, I’m sure I’d set out to track down those specific cards, rather than acquire a full run of the whole release. Unless it was a full Swamp Thing series, in which case, okay, they got me. Until then, I’m happy with the number of card sets I do have, in those half-dozen binders, resting on that shelf, where I can occasionally pull them down and look at them. And, of course, scan ’em and show them to you. 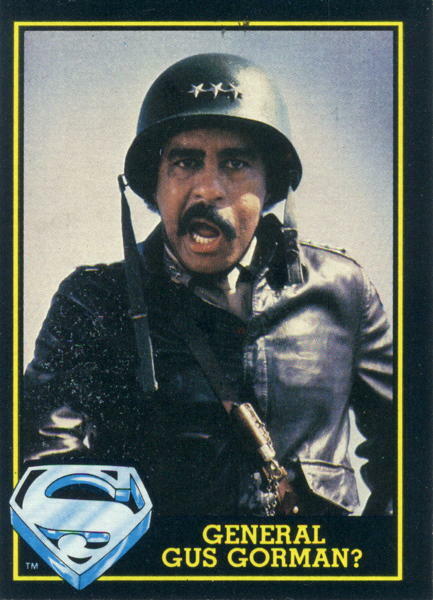 …and relax while basking in the glory of Richard Pryor. “Scratching off” is a terrible euphemism. 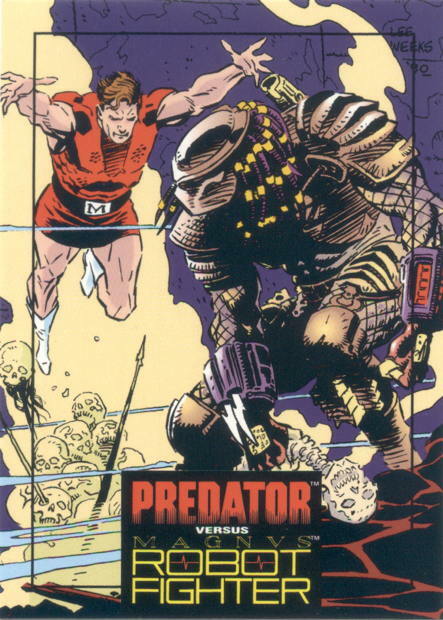 You know, this idea sounds so probable, especially in the gimmick-laden comics industry of the 1990s, that I think my brain actually tricked itself into believing such a thing actually happened. …It didn’t, at least not that I’m aware of, though if I’m wrong, I’m sure someone will correct and / or remind me. 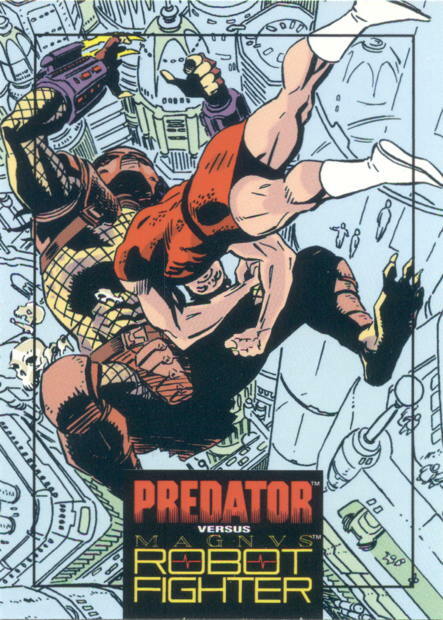 But I swear, I’m sitting here thinking “I know I scratched off something in a comic book…but what? WHAT?” and I’m hoping the answer isn’t “eyes from every character’s face” because that would be a bit weird. But…I don’t know. Was there maybe some kind of contest insert that needed scratching? I have no idea, but Michael G. bringing that up really triggered a very vague sense that such a thing has happened within recent memory. 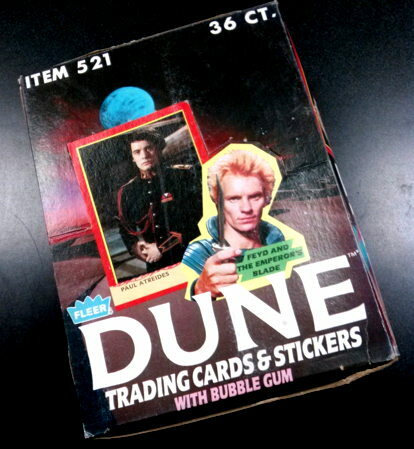 It did remind me of a particular…adult entertainment card set that we carried, way back in the wild ‘n’ wooly days of the trading card boom, and well out of the reach of young’uns, in which some of the special randomly-packed insert cards did indeed feature this scratch-off technology. I Googled shameful things to bring you hyperlinked, certainly Not-Safe-for-Work proof of these cards’ existence, and here you go. …It’s about as classy as you’re expecting. But anyway, if DC Comics is looking for a way to make that cover for Catwoman #0 even sexier…well, you folks there can have this idea for free. EDIT 6/15/12: Corey (Ottawa) reminds us of this G.I. Joe cover from late last year! 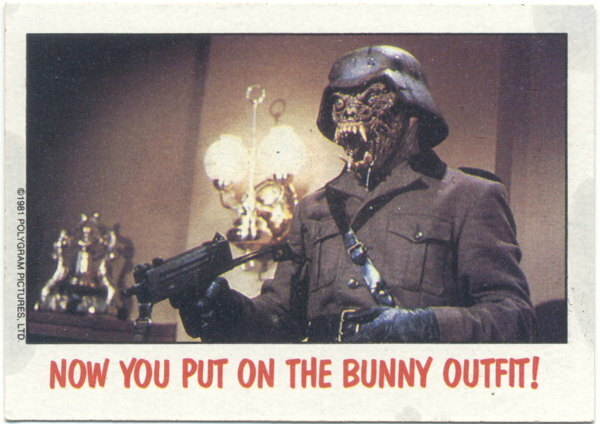 I think I’ve probably featured that Galactica card on the site before, but c’mon, just look at it. 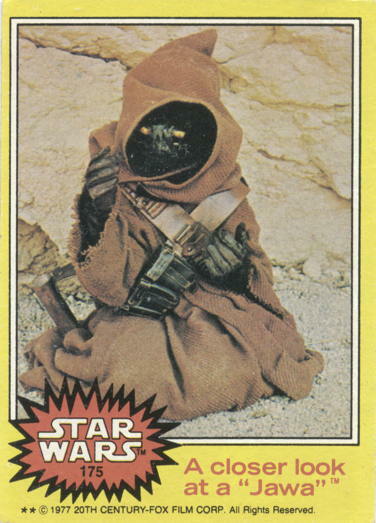 The official (or semi-official, or “canon,” or whatever) explanation is that the Jawas are “rodent-like,” and that what we’re supposedly seeing there isn’t a Jawa’s actual face, but just more protective covering with gemstone eyepieces. 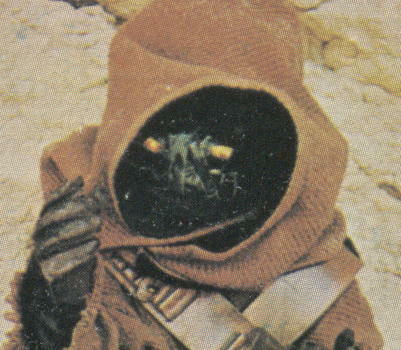 But I think it’s this specific image that has me associating Jawas with more insectoid characteristics than rodential. I mean, look at it…it’s like a giant ant under there. That’s completely creepier than a rodent. 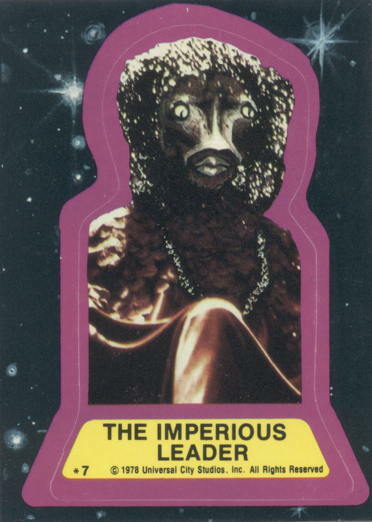 The Cockeyed Space Tyrant is puckering up…for you. 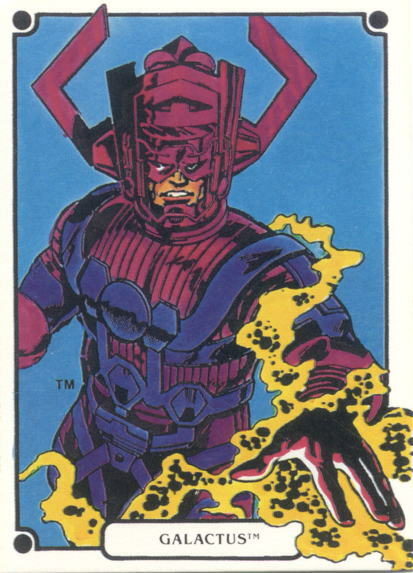 Somewhere there is fanfic somehow linking this guy to Galactus. …Unless I’m the first, in which case I’m not sure I could live with that burden. …Whaddaya mean, you don’t think that’s a bonus? I thought you people liked dudes in fezzes.